The Zo Rejuvination Facial restores tired, dull skin to its original glow. This facial features ZO®’s anti-aging products, tailored to your skin’s needs. The Zo Sensitive skin facial features Zo®’s best calming products that help to reduce redness and irritation, for a calm, glowing complexion. Ultra Hydration Treatment is designed specifically to target dry, dehydrated skin to restore hydration, and to provide soothing and calming comfort. Acne + Oil Control Treatment to clear skin and prevent breakouts. Skin Brightening Treatment targets pigment-related issues to help address dark patches and uneven skin tone. Be red carpet ready with our Red Carpet exfoliating and brightening facial. Skin is cleansed and exfoliated with ZO Exfoliating Polish and activator to smooth and tighten. As you relax ZO® Ommerse Daily Renewal creme is massaged gently into the face and neck to provide the skin anti-irritant and anti-inflammitory extracts as well as enzyme derivitaves which brighten and hydrate the skin to leave you with a healthy ZO® glow perfect for your special night out. If you’re on the go, our ZO Express Clinical Facial is the perfect answer to having great skin. Cleanse, exfoliate, extract, protect, and you are on your way in half time. You can do it all. Do you have a teenager with clogged, irritated skin? No problem, we’ve developed this ZO Teen Facial just for them. We start with a gentle cleansing to removes impurities, follwed by a micro-scrub to prepare the skin for extraction. A combination of AHA’s and salicylic acid minimize excess oil production and tighten pores. We follow this up with a calming massage and cleaner, healthier, oil free skin is revealed. Whether you’re a new mom or expecting we know that healthy skin is an important factor in feeling good about yourself. We have you covered with our ZO Mommy Skin Rescue Facial. We’ll cleanse, exfoliate, extract and brighten your skin with safe non retinal products approved for pregnant and nursing women, follwed by a relaxing facial massage to increase stimulation and provide you with an expectant mommy glow. The ZO Back Treatment utilizes microdermabrasion and corrective ZO Products for acneic, congested, and/or hyperpigmented skin on the back. This back treatment removes dead skin, increases circulation, and improves skin texture. The most advanced treatment available for prematurely aged and sun-damaged hands. ZO® Skin Health Advanced Hand Treatment has been created to correct existing damage, and prevent future damage in only four steps. This lush anti-aging treatment helps reduce pigmentation, fine lines and wrinkles, and improves hands’ overall texture, tone and color. The Microdermabrasion Facial utilizes tiny exfoliating crystals that gently exfoliate the skin. This treatment removes any un-even skin build up. Perfect for hyperpigmentation, fine lines and wrinkles, scarring, and congested skin. This Micro-Peel Facial includes a microdermabrasion treatment, paired with Amaris’ signature peel-tailored to your skin’s needs. 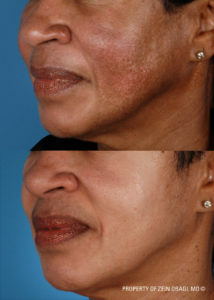 The Microplane Rescue Facial is a method of exfoliation that gently scrapes off the top layer of dead skin. 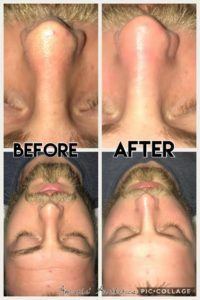 This facial brightens, and smooths dull, uneven skin, while also removing annoying peach fuzz. Make-up goes on flawlessly with an airbrushed affect after this treatment. Dermal infusion eliminates time gaps between exfoliation and serum application with an exclusive simultaneous infusion technology. Because of Dermal infusion’s distinctive simultaneous technology, plumpness, volume, hydration, tone, and texture are optimized. The key to the Dermal Infusion technology lies in its line of specifically formulated, professional strength Pro-Infusion serums. Each serum is the product of advanced research in skin care science and is designed to address a specific skin condition. Treats head-to-toe. Q: What is the difference between Dermal infusion and Microdermabrasion? A: While both Dermal Infusion and Microdermabrasion remove a portion of the upper layer of the skin, or the stratum corneum, the Dermal Infusion treatment is much more controlled and consistent in the way it operates. 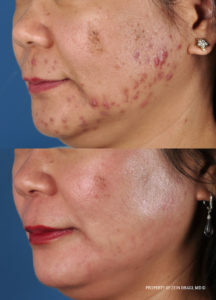 Dermal Infusion uses the controlled vacuum pressure to pull the skin up into a chamber in the hand piece, where it is evenly abraded just as aggressively or as softly as the vacuum pressure is set by the skincare professional. This is significant, because all other devices rely on the operator to apply the same pressure, at the same speed, consistently over the skin. The process of controlled exfoliation, or microdermabrasion is where the comparisons stop. However, it is just the beginning of the actual Dermal Infusion treatment one receives during the procedure. 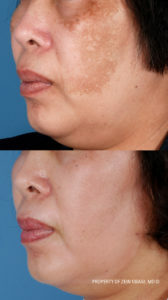 With a Dermal Infusion treatment, that same controlled vacuum pressure that is used to pull the skin into the chamber, allowing the diamond abrasive tip to very consistently remove the stratum corneum, is also driving a condition-specific topical solution deep into the skin, right down to the dermal junction where the skin cells are regenerating.